With all our visits to the Imperial Hotel over the years my brain never managed to connect the dots as to where I thought the Windsor Hotel was. I knew it was near Parliament station somewhere, maybe behind Parliament house? Or further down Spring Street... I never put together that the beautiful Renaissance Revival architecture building I spied many times directly across the road from the Impy rooftop was, in fact, the Windsor itself. It had been a while since we visited the CBD (funnily enough our last visit was for the Impy redo back in May), I was itching to get back to the big smoke to try another parma so I googled around for a pub in the city that we were yet to try and the Cricketer's popped up. I have it on good authority that the Queen reads ParmaDaze weekly* - So surely the Windsor's wouldn't lend their name to an inferior parma! We loaded up the parma bus and ventured into the Cricketer's Bar to find out. First things first - The Cricketer's Bar is an awesome little pub. It's cosy, quaint and oozing history (the Cricket memorabilia lining the walls is worthy of of a museum). Table space is limited so we pulled up seats along what is possibly the widest bar in Melbourne - A meter at least of bar space separates the patrons from the bartenders. It's a slice of history I am so happy to see still exists in our fine city. Proximity to the 'G makes me think that it would get quite cramped on game day, While it was busy on the Thursday night that we visited we had no issues pulling up a pew at the bar. The tap list at the Cricketer's is pretty standard (Carlton, Creatures, Squire, Furphy etc.) with the addition of one rotating craft beer tap for those after something a little different - Check out what's on rotation when you visit as it seems to change monthly. When nature calls after a few beers (as it tends to do) the walk to the gents' will take you through the halls and down into the bowels of the Windsor Hotel - It's a great walk, very pretty, if you want to experience the Windsor Hotel it's worth checking out, even if you don't have to go so badly. The Ladies' is closer, but you still need to walk across the sprawling hallways of the Windsor, so it's worth the trip. The schnitzel was bordering on the small side, but pure chicken breast throughout - Unfortunately when it was served the chicken was quite dry and a little stringy - Not the best start to our parma experience. It was crumbed well and had the appropriate crunch, it just wasn't award winning on the inside. The toppings were a mixed bag. The cheese was plentiful and flavoursome, although could have used a few more minutes under the grill. The thick cut ham was appreciated and made its presence known. The napoli sauce, however, was pretty much pure tomato paste. It was quite strong and overwhelmed a lot of the flavours trying to punch their way through. The chips were also fine - Didn't blow us away or anything but there was a decent serve (despite the above aerial shot showing a lot of white space on the plate, we managed to rescue them rather quickly). They were cooked well, just could have used a bit more seasoning to finish them off. The fennel salad was, without doubt, the best thing on the plate - Surprising, as I normally hate fennel and any dish that uses it as an ingredient - However here its use was subtle. It paired with the fresh, well dressed salad perfectly - And the healthy whack of freshly shaved parmesan thrown in for good measure really elevated this to a salad that we will remember for a long time to come. I'd hesitate paying another $24 for the parma at the Cricketer's. 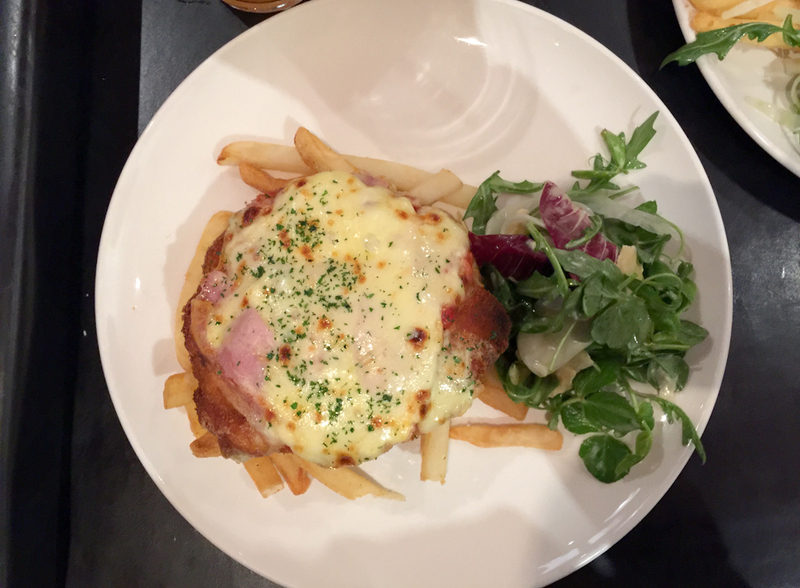 It's a passable parma, however with the Imperial across the road serving up one of the best in Melbourne it is really hard to justify not crossing over there and putting your hard earned dollars to better use. Don't get me wrong, I loved my visit to the Cricketer's Bar. It's an iconic institution that is just as vibrant in 2017 and it was in 1898. If you've ever visited a sports bar you can think of the Cricketer's as the genesis of that kind of pub. It's a slice of Melbourne's History that simply must be experienced, especially if you are a Cricket fan. The parma didn't blow us away by any stretch but it's worth trying at least once if only to experience this classic Melbourne pub. *Not really. Please don't sue, I was pro Monarchy in the '99 referendum!